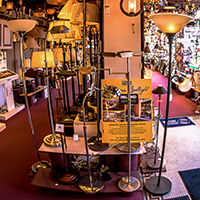 Our staff at Inland lighting has spent years working hard to cultivate the best lighting selection in town. 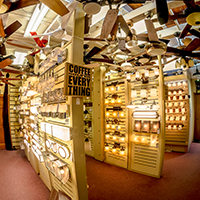 Our showroom carries a wide array of brands and products, all hand-picked by our experienced team of lighting experts. 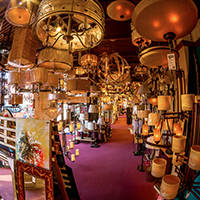 We firmly believe that the lights in your home and business are more than just necessary – they are an expression of your vision. 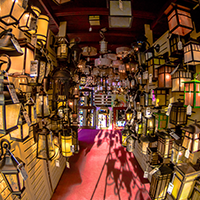 Let our experienced and knowledgeable staff help you choose the lighting option that is right for your space. We will gladly talk through any questions you may have and discuss which options are appropriate and doable for your business or home. Overhead Lighting is a seldom spoken about, but much appreciated luxury that we believe you deserve. Whether you are hanging art or looking to light up a mirror, wall lights can help increase the visibility of what you want to see. Tired of that loud box fan? 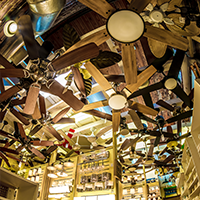 A ceiling fan is a quiet and more aesthetically pleasing alternative. Combining function with fashion, lamps give you an opportunity to express your unique style. 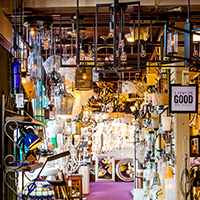 We offer clocks, mirrors, and other home decor to make your home look exactly the way you like it. Your outdoor space should be comfortable, too. Because of that, we offer outdoor lights and fans. Come visit our showroom today, we are always happy to see you! Or, if you have any questions for us, feel free to call. A member of our friendly team would be happy to help you.